Fork in the Road, which serves as a culinary training program for teens. My first stop included having a school breakfast with the students at Crossett Brook Middle School in Duxbury. Food Service Director Erika Dolan showed me how they prepare fresh, local foods every day. She said each item on the breakfast menu – right down to the butter for the whole grain pancakes – is locally sourced from area farms. Next up was a lunchtime trip to Burlington High School. Here, I spoke to Food Service Director Doug Davis, who helped start the farm to school movement in 2003, and has watched it grow. A portion of the total cost of food served in the school goes directly to local producers, growers and dairies. Also, the Burlington School Food Project connects students and families with fresh, local foods. 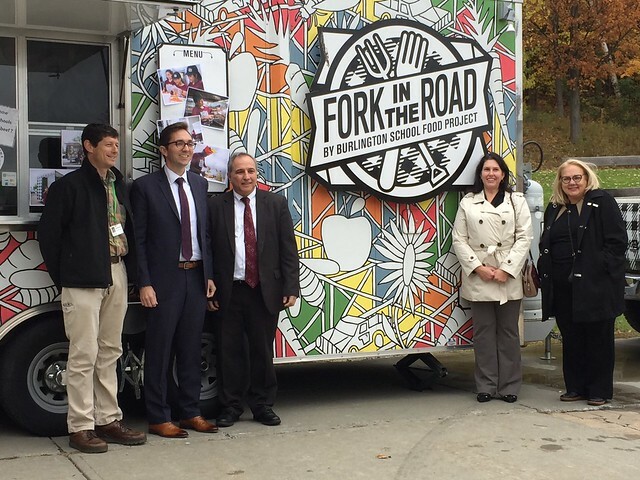 Part of this effort includes a food truck, Fork in the Road, which serves as a culinary training program for teens. My visit underscored how farm to school activities strengthen the American economy and connects students to the farm. Schools like these contribute to a stable market for local producers, and provide dependable revenues that boost the regional economy. Farm to school also helps kids to learn where their food comes from and inspires them to try foods they have grown or prepared. I may be partial, but what could be better? To further support these priorities, USDA recently announced the Fiscal Year 2019 Farm to School Grant Program Request for Applications (RFA), open to applicants through December 4, 2018. Award decisions are expected in late spring or early summer of next year. For more information about available grant tracks, visit USDA’s Farm to School Grant Program Page. To learn more about Farm to School best practices and benefits, check out the new USDA grantee report, Cultivating Opportunity: An Overview of USDA's Fiscal Year 2015 and 2016 Farm to School Grantees' Growing Achievements (PDF, 19 MB). 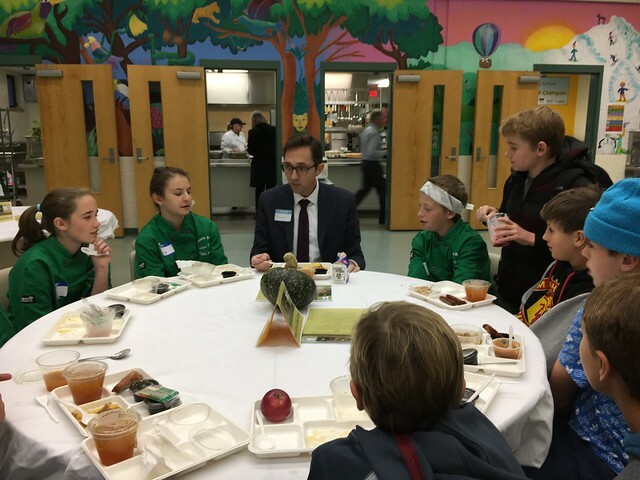 Acting USDA Deputy Under Secretary Brandon Lipps talks with students during a recent visit.